Big kudos to my baking buddy, G, who has a gift for choosing good cookie recipes to bake. During our recent baking session, out of the hundreds of cookie recipes in my 528 page cookie cookbook (King Arthur Flour Cookie Companion), G chose Chocolate Wakeups. 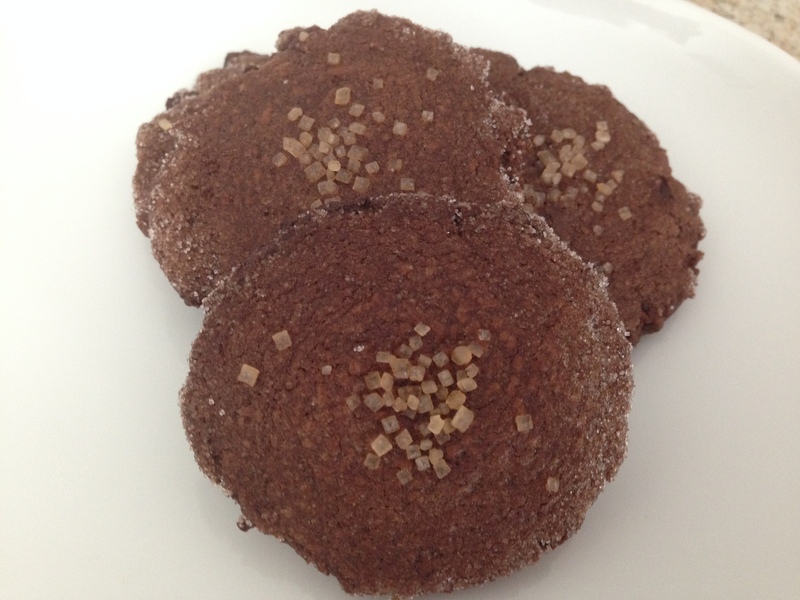 These crunchy edged, tender center shortbread chocolate cookies are highlighted by cinnamon with a touch of heat from black pepper and cayenne pepper, and the sprinkling of turbinado sugar on top gives them an extra crunch. And if that’s not tempting enough, these are easy and fast to make. My notes are in [ ] below. I also rewrote some parts of the recipe to be more in line with the order that I like to mix together my ingredients. In a medium size bowl, stir together the cocoa and flour until well combined. Set aside. In a large bowl, cream together the butter, sugar, vanilla, peppers, cinnamon, and salt. Beat in the egg to the wet ingredients. Add the flour-cocoa mixture to the wet ingredients and mix. The dough will be very stiff. Bake the cookies for 10 to 11 minutes. They won’t look any more brown than the raw dough, and they won’t feel done, but that’s the correct time and temperature. Remove the cookies from the oven, transfer them to a rack, and let them cool. 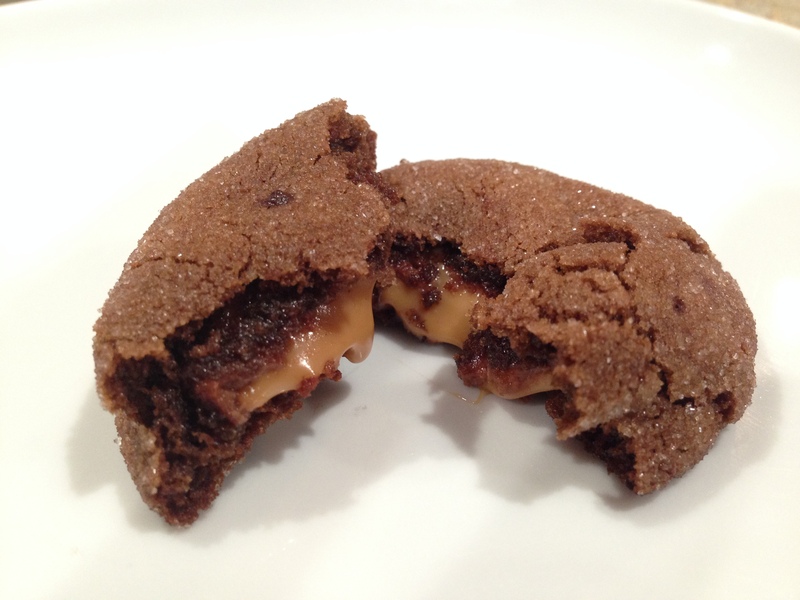 One of my most profound discoveries from my college years was coming across this Chocolate Rolo (Caramel) Cookies recipe among the little recipe books stuffed in shelves at the supermarket checkout line. Over the years, I’ve made these cookies for nearly every occasion, celebration, commiseration,etc., and anyone who knows me remotely well and/or has lived in somewhat close proximity to me has at some point in their lives tried these cookies. The soft, fudgey chocolate cookie with slightly crisp edges gently cradles a single Rolo in the center, which right out of the oven oozes with caramel when you split the cookie down the middle. After the cookies have cooled a bit, the caramel firms up to a chewy texture which provides yet another dimension to the cookie. I’ve made a few tweaks to the recipe over the years so you could say it’s reached the “old family recipe” status of awe. 1. In medium bowl, stir together the flour, cocoa powder, baking soda, and salt; set aside. 2. In large bowl, beat together 1 cup of sugar, brown sugar, and butter until light and fluffy. I recommend using a stand mixer if you have one to ensure everything is mixed really well. Scrape down the bowl as needed. 3. Add the vanilla and eggs, and beat well. Scrape down the sides of the bowl as needed. 4. Gradually add the flour mixture to the wet ingredients, and make sure everything is mixed well (scrape down the bowl), but do not overmix the dough. 5. Cover the dough with plastic wrap, and refrigerate it for 30 minutes or more until the dough firms up a bit. 7. Roll the dough into a ball. Then roll the dough ball in sugar to create a light coating. 8. Place cookies approximately 2 inches apart on ungreased cookie sheets or cookie sheets lined with parchment paper. 9. Bake at 375°F for 7 to 10 minutes or until the cookies are set and the tops are slightly cracked. They will still be a bit soft and puffy, but do not overbake as the bottoms may burn. 10. Let the cookies cool on the cookie sheet for about 2 minutes. This is important because the cookies are really delicate right out of the oven and can break easily. Plus, their centers are heavy (because of the caramel), and if you move them before they’ve firmed up a little, the centers will fall out. Then remove the cookies from the cookie sheets and cool on a wire rack for 15 minutes or until completely cooled. Notes: I highly recommend eating some cookies before they’re completely cooled so that you can experience the caramel oozing out of them. However, be very careful as the caramel can be hot. These cookies are best the day that they’re baked, and they will keep well for about 1-2 days. After that they get a bit dry and crumbly. It’s time to up the ante on chicken noodle soup, and this Italian Wedding Soup will do it. 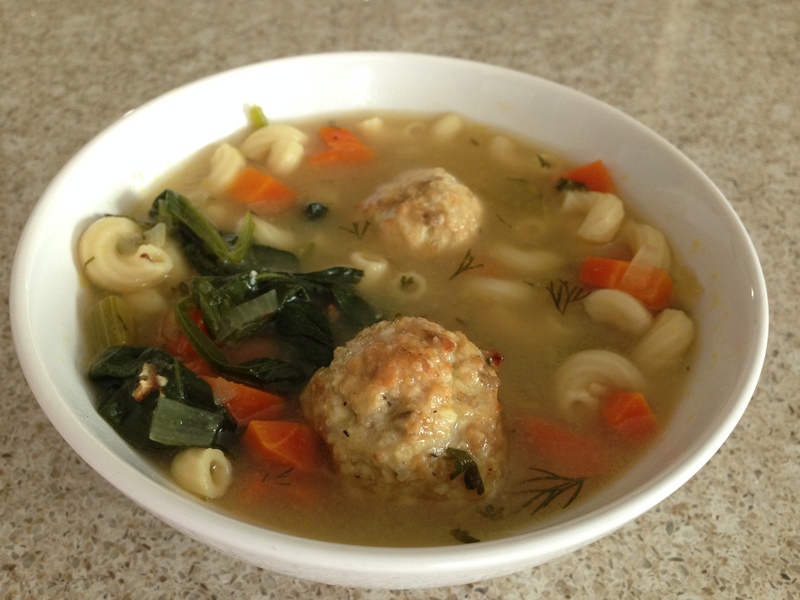 Homemade chicken meatballs (seasoned with Pecorino Romano and Parmesan cheeses) bob among carrots, celery, dill, spinach, and pasta in a rich chicken broth. Don’t be intimidated by the homemade meatballs- they’re easy to make, and if you can make cookies, you can make meatballs. Place the ground chicken, sausage, bread crumbs, garlic, parsley, Pecorino, Parmesan, milk, egg, 1 teaspoon salt, and 1/2 teaspoon pepper in a bowl, and combine gently with a fork. Bake for 30 minutes, until cooked through and lightly browned. Set aside. While the meatballs are baking, heat the olive oil over medium-low heat in a large heavy-bottomed soup pot. Add the onion, carrots, and celery, and sauté until softened, 5 to 6 minutes, stirring occasionally. Add the chicken stock and wine, and bring to a boil. Add the pasta to the simmering broth, and cook for 6 to 8 minutes, until the pasta is tender. Add the fresh dill and then the meatballs to the soup, and simmer for 1 minute. Taste for salt and pepper. Stir in the fresh spinach, and cook for 1 minute until the spinach is just wilted. Ladle into soup bowls, and sprinkle each serving with extra grated Parmesan cheese. 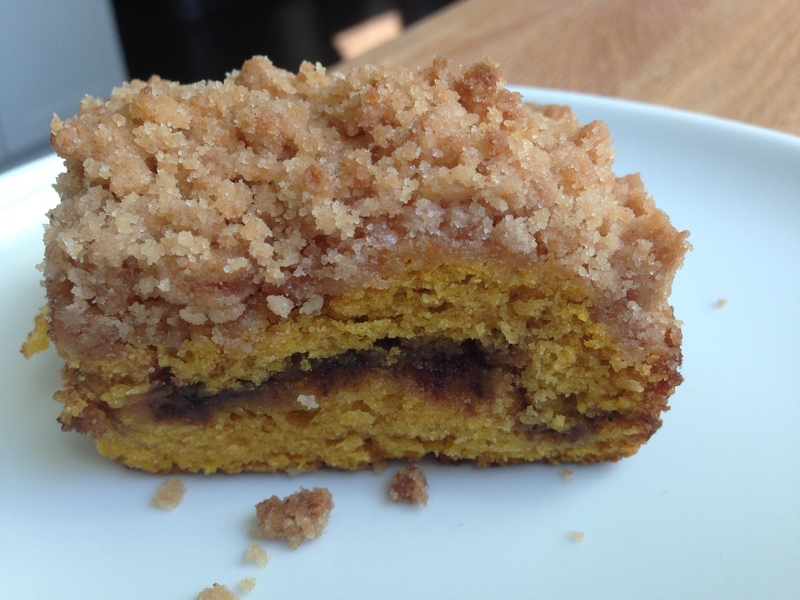 This recipe for Pumpkin Streusel Coffeecake is the perfect recipe to piggyback onto the Pumpkin Bread with Cream Cheese Swirl I made last week. The recipe for the Pumpkin Bread with Cream Cheese Swirl only used up half of a 15 ounce can of pureed pumpkin, and this recipe for Pumpkin Streusel Coffeecake makes very efficient and delicious use of the other half of pumpkin puree. A cinnamon sugar swirl weaves its way through the tender, moist, and cinnamony pumpkin cake, and the crunchy streusel that sits atop provides a nice textural contrast. Up until now, I’ve had bad luck with streusel. Sometimes it’s too clumpy, sometimes it doesn’t bake up crispy enough, sometimes it’s not very flavorful, etc. This recipe for the streusel is the best I’ve come across so far. It bakes up crunchy and has just the right amount of sweetness. I’ll definitely use this streusel for other recipes. This looks just like how coffeecake should look with the clearly defined layers. I’m officially announcing this as my first successful coffeecake (I’ve made at least 3 different coffeecakes in the past that were never quite “right”.). Whisk together the sugar, salt, flour, spice, and nuts [if you’re using nuts]. Add the melted butter, stirring just until well combined. Set the topping aside. Mix together the brown sugar, spice, and cocoa powder. Note that the cocoa powder is used strictly for color, not flavor; leave it out if you like. [The chocolate flavor is not discernible when everything is baked up.] Set it aside. Beat together the oil, eggs, sugar, and pumpkin. In a separate bowl, stir together the flour, spices, salt, and baking powder. Add the flour mixture to the wet ingredients and stir just until smooth. Sprinkle the cinnamon sugar filling evenly atop the batter. 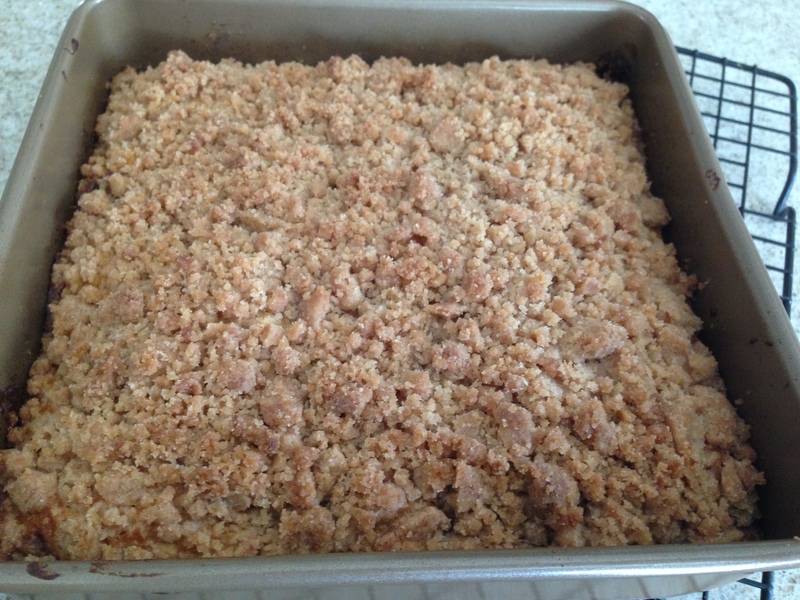 Sprinkle the streusel topping over the batter in the pan. Remove the cake from the oven, and allow it to cool for 20 minutes before cutting and serving. Serve the cake right from the pan. In addition to that trip to the Galapagos Islands and learning to juggle, please add this Baked Chocolate Pudding to your Bucket List. I know it doesn’t look like much, and I had such low expectations for it that I didn’t even bother photographing it until I only had 7/8 of it left. But despite its humble appearance, this Baked Chocolate Pudding is one of those desserts that if left sitting on the kitchen counter, you won’t be able to resist eating spoonfuls of it each time you pass by. This dual personality dessert has a top that is crispy and crackly, like the edges of a nearly overbaked brownie while the center is a smooth, creamy, molten chocolate cake. Serving it with fresh raspberries and a scoop of Haagen Dazs vanilla bean ice cream completes the trinity of dessert perfection. Lightly butter a 2-quart (9 x 12 x 2 inch) oval baking dish. Meanwhile, sift the cocoa powder and flour together in a small bowl, and set aside. When the egg and sugar mixture is ready, lower the speed to low and add the vanilla seeds [I used vanilla bean paste], framboise (if using) [I didn’t have any framboise so I served fresh raspberries on the side], and the cocoa powder and flour mixture. Mix only until combined. With mixer still on low, slowly pour in the cooled butter and mix again just until combined. Pour the brownie mixture into the prepared dish [Don’t worry if the batter fills most of the pan as it doesn’t rise much during baking], and place it in a larger baking pan. Add enough of the hottest tap water to the pan to come halfway up the side of the dish. [Do not skip this step of baking in the water bath. It’s what gives this dessert its contrasting textures of crispy top and gooey, smooth center.]. Bake for exactly 1 hour [I was nervous about it being underdone, so I baked it for an hour and 5 minutes. It came out the perfect texture for me]. A cake tester inserted 2 inches from the side will come out three-quarters clean. 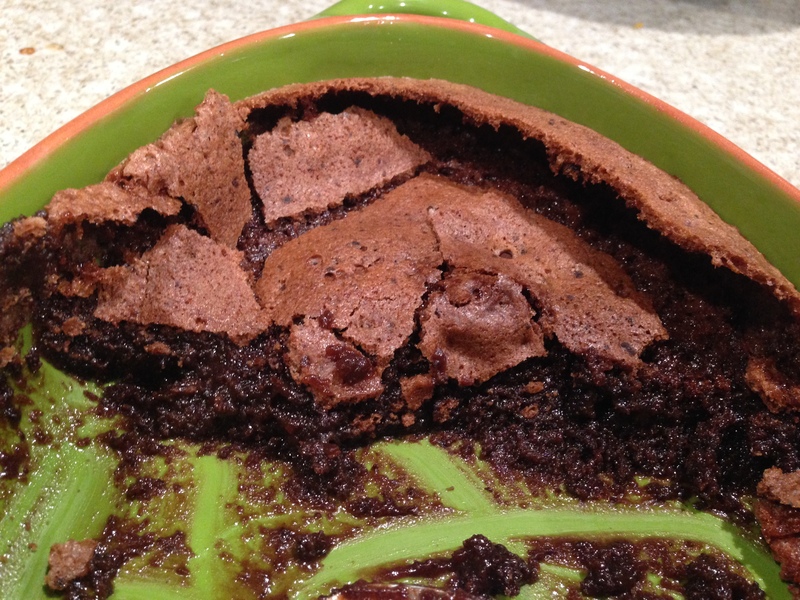 The center will appear very under-baked; this dessert is between a brownie and a pudding. Allow to cool and serve with vanilla ice cream [and fresh raspberries].